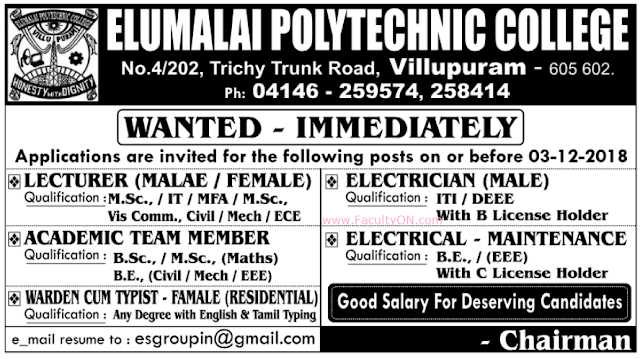 Looking for Lecturers jobs in Polytechnic Colleges 2018 in Tamilnadu? or Searching for Faculty Plus Teachers Tamil Nadu November 2018? or Faculty on Villupaurm 2018 or Facultyon Villupuram November 2018? 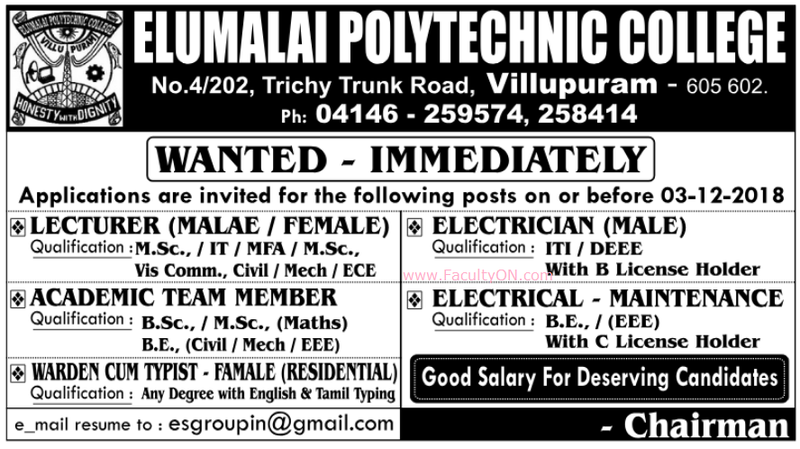 A college based in Villupuram named Elumalai Polytechnic College, Villupuram has advertised for recruitment of Lecturers Plus Non-Faculty jobs vacancies. Interested and eligible job aspirants are requested to apply as soon as possible from 03rd December 2018. Check out further more details below. About College: The Elumalai Polytechnic College owes its existence to the beneficiation and philanthropy of Thiru. E. Swamikkannu, a business magnet of Villupuram. He envisaged Villupuram District, which would be in the forefront of the technical educational area, imbibed with lofty ideals. He was instrumental in establishing a Polytechnic College at Villupuram, which has become an invaluable blessing to the people of Villupuram District. Named after his father, the Polytechnic College with its imposing buildings stands at Salamedu, the southern outskirts of the town on the Trichy Trunk Road.